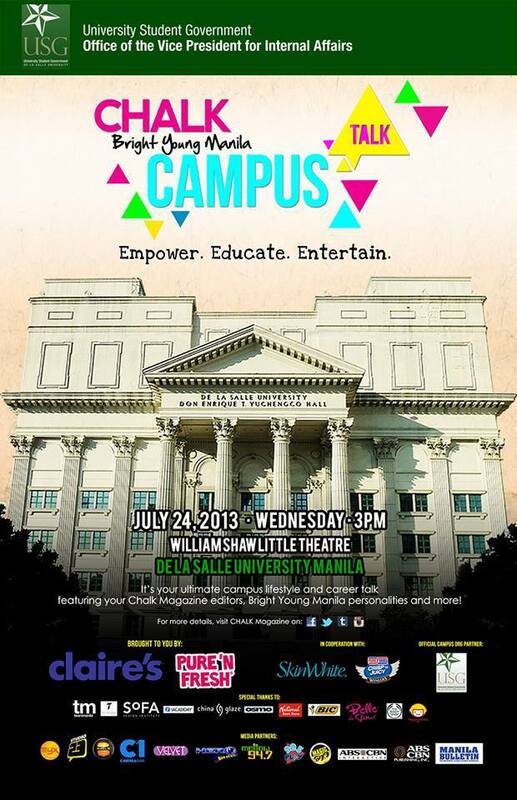 CHALK MAGAZINE, in cooperation with DLSU's University Student Government (USG), presents a talk on Youth Empowerment on July 24, 2013 (Wednesday, 3pm) at the William Shaw Little Theatre in DLSU. Make way for #chalkBYMcampustalk as they give back to the students and conquer the campus scene once again. This event will feature the editors of CHALK Magazine, Bright Young Manila Personalities, finalists, La Salle Dance Company-Street and a whole lot more! This is brought to you by the Office of the Vice President for Internal Affairs (of USG) and CHALK Magazine.